Published: March 21, 2011 at 06:19 p.m. 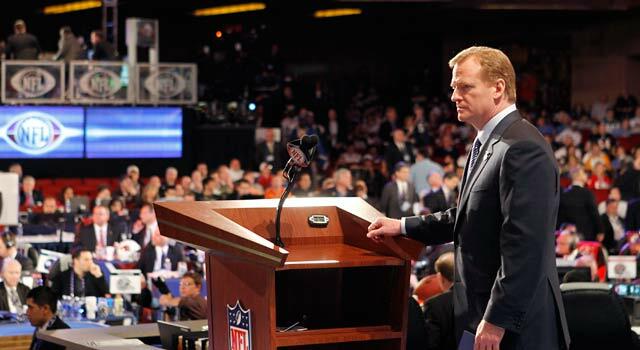 Despite labor unrest, NFL Commissioner Roger Goodell will take the podium again at the 2011 NFL Draft in April. The only certainty we know about the short-term future of the NFL is that there will be a draft. The NFL Players Association has decertified, and the direction of a new collective bargaining agreement will be handled by the courts. I've had wide-ranging conversations with rookies, agents, general managers, and owners over the past few days, and the concerns are extensive. Nobody is comfortable, although everyone feels, at some point, there will be football played in 2011. Under what rules, no one knows. That's where things get maddening. So let's just peruse some of the questions and topics that seem to be on people's minds, especially as to how they pertain to the NFL Draft. Question: How are teams and players viewing free agency with things looking like the market won't open up until after the draft? First off, every front-office executive and owner I've spoken to says his team is prepared for free agency if it were to begin immediately. They say they have plans in place for unfettered free agency -- all non-franchised players with more than four years experience (Sidney Rice, Cullen Jenkins, etc.) being available -- as well as free agency involving players with six or more years on the market. So much depends on what rules are established or bargained. One owner told me that his team has its free-agent priority lists intact, and that they are ready to move as if things were "normal." The thing is, if free agency doesn't start until after the draft, some player agents I've spoken to fear that free agency won't be valued as much because teams could address their needs in the draft. For instance, if a team had Rice earmarked as a free agent but first has the chance to draft Maryland wide receiver Torry Smith, who would likely cost less and might have greater longevity because he is younger, it could go that route and address other needs via free agency. That said, teams typically don't dramatically alter their draft and free-agent boards despite the normal free agency period before the draft. If a team feels that it is close to a playoff berth and wants a veteran free agent to fill a void, that's typically the route. At some point, there will be free agency. What will likely be most affected is the price teams are willing to pay. Question: How could the draft be affected if the courts rule that the NFL can't lock out non-union players and that the league has to operate under previous rules? This scenario looms large in how teams are planning to build their teams. Owners and players were collectively bargaining some form of a rookie wage scale before negotiations broke off. Should football be forced to play under 2010 rules, it could have a far-reaching impact. Consider that agents could want rookies to get bonuses based off last season's rookie contracts. Rams quarterback Sam Bradford got $50 million in guaranteed bonuses as the first overall pick. Carolina has the No. 1 pick this season and could face similar costs to get the top selection signed. Even if 2009 rules are implemented, agents could ask for the bonus scale for high draft picks to be similar to that of last season, or be based off the 2009 scale. Detroit paid quarterback Matthew Stafford $42 million guaranteed as the first overall pick in 2009. As of now, no one knows what rules will be in place before or after the draft. A rookie wage scale could be implemented, or not. That depends, in all likelihood, on whether the NFL operates under court-ordered or collectively bargained parameters. "It's all speculation because we don't know what set of rules we'll be operating under," Falcons owner Arthur Blank said before leaving to this week's NFL Annual Meeting. "You prepare with what you need and want you use your resources to be flexible and committed to what you've always been committed to and in our case, that's putting a winning team on the field." Also, if a season is played under 2010 rules, there would once again be no salary cap as well as no salary floor. Some teams, as we saw last season, will spend on free agents as well as extending their own players to long-term deals. Others won't. If 2009 rules or something similar are applied, there would be both a salary cap and a minimum. Figuring out what those would be is unknown. If/when an agreement is reached, a cap and a floor also are expected to be re-instated. Question: The NFL plans to invite rookies to attend the NFL draft at Radio City Music Hall, while players said they might have an alternate rookie event in New York. We've heard both sides on this, but how do some of the players feel? I had the pleasure to speak with projected first-round picks Prince Amukamara, Marcell Dareus and Cameron Jordan during appearances on NFL Network's "Path to the Draft" and "NFL Total Access" last week. On a side note, they were all very solid young men and conducted themselves like pros already. Each was asked what they felt about the situation and, clearly knowing that line of questioning was coming, said they weren't sure about what they would do. It was clear that the rookies aren't comfortable with both sides wanting a piece of them, but that they also don't want to alienate their future organizations or teammates. The feeling I got from all three players is that they hope something is determined well in advance of the draft, which would ease the pressure so they're not being used either way. Question: There are a lot of rumors floating around about whether Carolina will draft a quarterback. Why is Cam Newton better than Blaine Gabbert -- or vice versa? What's the skinny? Here is the deal: We are still more than a month away from the draft. So much could change with one pro day, one injury, one arrest, etc. I've had to tell that to a lot of people, just as a lot of people have told that to me. Understand that now is when misinformation is being cast and perceptions change. No team has solidified its pick yet. It is simply too early. I have had so many varying takes on Newton's future that I know a lot of people are blowing smoke. Seriously, I've been told that the Panthers like him, that they don't, and that now they like him again. All of that doesn't mean he's not their guy, though. Dareus, Gabbert, wide receiver A.J. Green, cornerback Patrick Peterson, and defensive end Da'Quan Bowers are in play too. There are probably a few other players the Panthers are considering, but that's the short list. As it relates to the top-rated quarterbacks, one common question being asked by a lot of different people in the football business is if Stanford quarterback Andrew Luck had decided to enter this season's draft, would either Gabbert or Newton be getting nearly the run that they have? Neither is considered to be as NFL-ready as Bradford, Stafford or Matt Ryan, but each -- and I'm mashing up some of the opinions I've been told -- has Josh Freeman-like potential. Freeman wasn't taken until the 17th overall pick in 2009, though. As good as Freeman is and as great of a player that he could become, a lot of front office types feel Newton and Gabbert might be closer to late top-10 or even mid-first round value. It is a quarterback-driven league, though. As one general manager told me, a lot of his colleagues are feeling an inordinate amount of pressure to find the right quarterback. Not only to help their team, but in some cases, out of fear that they might skip a quarterback who becomes great elsewhere. That could not only be a job-killer, but a career-killer. That fear, the general manager told me, could prompt teams to reach for a player earlier in the draft who projects to be taken later.